What do you do when the skiing conditions are less than stellar, but you still want your snow fix? Snowshoe! 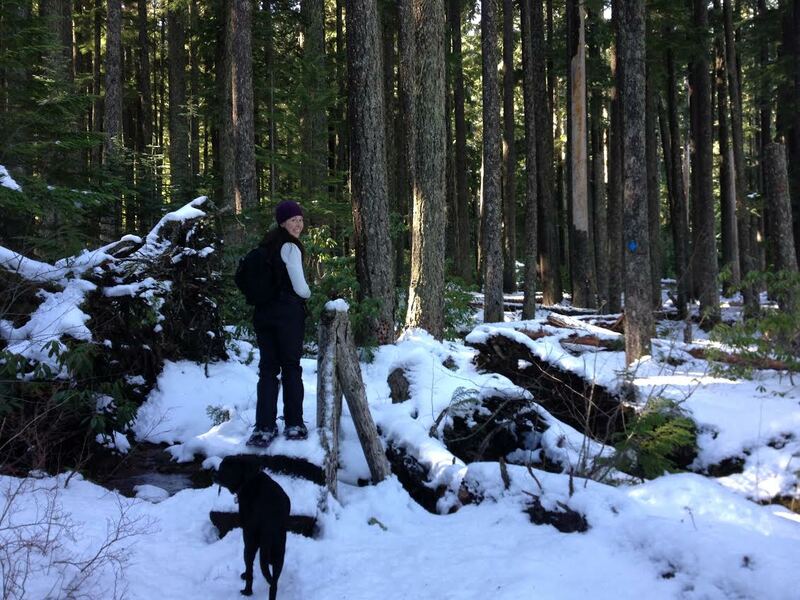 Exploring the backcountry trails is a great way to get out in the snow without having to rely on the winter gods to bless the Cascades with perfect, powdery confection. 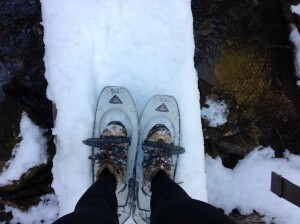 And if you love the majestic magnificence of immense, misty waterfalls, then you will want to make the Salt and Diamond Creek Falls hike the start of your snowshoeing adventures. 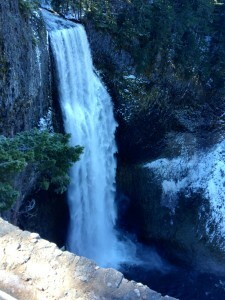 This 3.4-mile loop takes you first to Salt Creek Falls, which at 286-ft is the second tallest waterfall in the state (the tallest is Multnomah Falls located in the Columbia River Gorge), and then to Diamond Creek Falls, though not as tall as Salt Creek, is certainly no less impressive. The hike is appropriate for the rookie snowshoer, but depending on the direction you take the loop, the elevation gain to get to Diamond Creek Falls has plenty of unrelenting uphill to burn the calves and glutes of the most active backcountry rambler. Snow had the road to the Salt Creek Falls entrance closed, so my friend Molly and I parked in the back lot by the sledding hill. We popped on our snowshoes at the gate to the closed road and headed in, enjoying a 0.7 of a mile trek on nicely packed snow to the entrance. 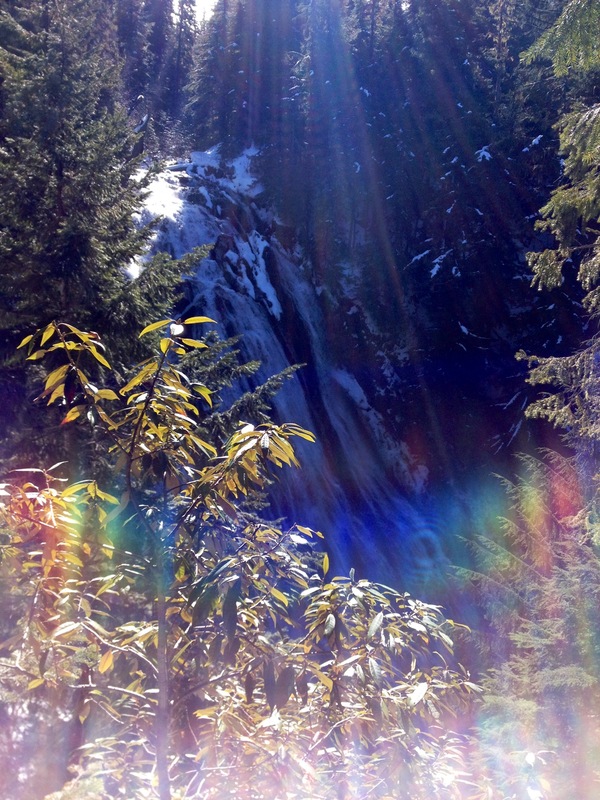 A jaunt on a sweet little footbridge over Salt Creek and before we could blink, we were on top of the dramatic height of Salt Creek Falls, the mammoth bowl of a canyon the water has carved out, and, on this morning, a rainbow in the sharp February sun. If there is enough snow to make the steps navigable, you could hike further up to more lookouts and wind down the trail for delightful snapshots of the falling water. Such snow wasn’t in our forecast this weekend, so we turned back to link up with the trailhead for the Diamond Creek Falls loop. Turn left and you get 1.8-mile gradual climb to the falls; turn right and you’re getting a weekend workout on steeper inclines, the occasional switchback, and one-snowshoe-in-front-of-the-other drop-offs. Never ones to back down from a challenge, Molly and I turned right to begin the loop. If the sublimity of these two colossal waterfalls is the best part of this hike, then the second best part of this loop is the abundance of viewpoints overlooking the deep green canyon hugged by the surrounding hills (just ignore the trucks barreling up and down Highway 58 across the canyon). In the snow, these viewpoints are soft mounds of sparkling white that roll in curves off the trail and back. It’s impossible to get lost on this trail; every few hundred yards you’ll see a tree marked with a blue diamond letting you know you’re safely inbounds. Molly pleasantly postulated that these diamonds were left as gems by previous trekkers who wanted to mark the trail for any seeker of beauty that might follow. Again, in enough snow, you can take a steep side trail to the lower falls; otherwise, climb on. Your steady ascent will be compensated by the beauty and glory of Diamond Creek Falls, a waterfall that descends in wide, waving gushes. Your eyes and leg muscles are amply rewarded, and if you get up early, you’ll have the trail to yourself. It was just Molly, me, and my dog Maggie on the way in, but we encountered many a snowshoer and waterfall enthusiast just venturing in on our way out of this winter wonder-fall-land. The forest service recommends checking the conditions at the Salt Creek sno-park before heading out. 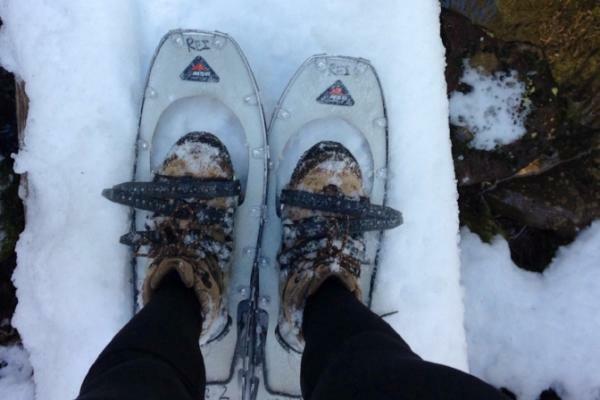 Additionally, if you want to make this snowshoeing trek a full-day affair, before looping back from Diamond Creek Falls, follow the Vivian Lake Trail 1.3 miles to Fall Creek Falls and then one more mile to a reflection of Mt. Yoran in the clear waters of Vivian Lake.